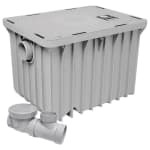 This Canplas grease trap has a 40 lb capacity and is constructed of high quality thermoplastics that will provide you with years of service. Keeping your plumbing in quality condition starts with having a high quality grease trap under your sink to assist in preventing build up and debris in your pipes. Because of this unique design, this grease trap will not corrode, peel, chip or dent. The two in connection provides you will excellent functionality and with a maximum operating temperature of 220 degrees, this grease trap can handle even the most rugged kitchens. 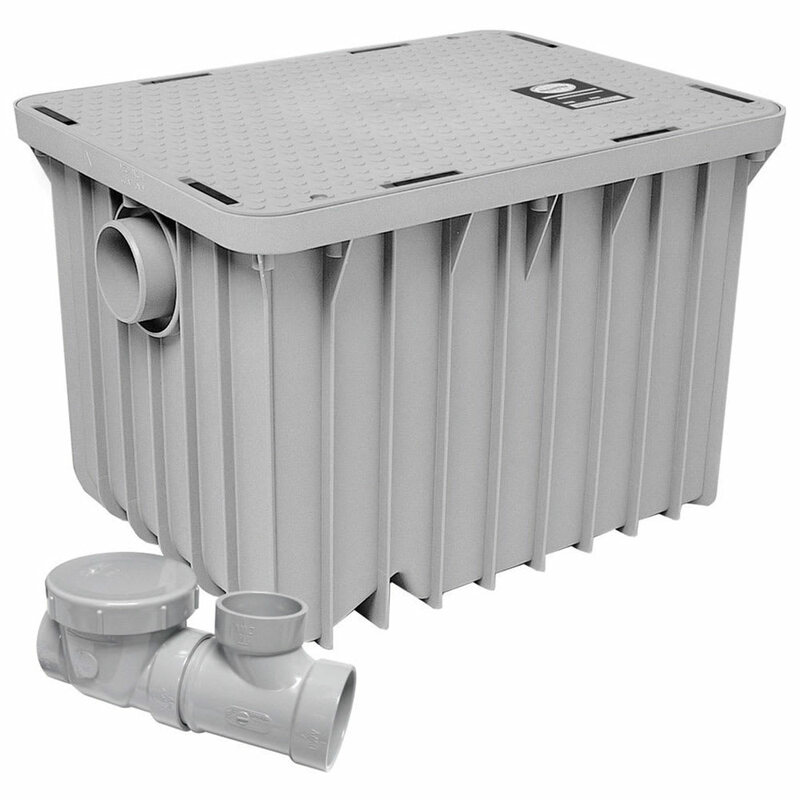 Both baffles are removable for easy tank cleaning and because of the patent pending baffle design this grease trap provides you with better grease retention and debris removal! Save money, time and aggravation down the road by preventing clogs and build up before they happen with this 40 gallon capacity grease trap! The precision molded Canplas Endura Grease Interceptor offers an effective alternative to traditional metal grease interceptors and is engineered to conform to strict plumbing codes and is certified by the Plumbing and Drainage Institute. Injection molded in high quality thermoplastics the Endura Grease Interceptor provides the best combination of lightweight and strength. Both the tank and lid utilize integral reinforcing ribs to enhance rigidity and impact resistance. Unlike traditional grease interceptors, the injection molding process provides the Endura Grease Interceptor with a completely integrated surface that will not corrode, chip or peel. The unique, patent pending baffle design provides superior grease retention and removal of solids, even under the most severe application. The tank and baffles of the Endura Grease Interceptor are injection molded in polypropylene providing the best combination of light weight and strength. External reinforcing ribs on the one-piece, molded tank provide additional strength and rigidity for 'in-floor' installations. The grease interceptor cover has a light duty loading classification when tested to CSA Standard B79 .1. The design load of 440 pounds is sufficient for foot and light traffic only. Strengthening cross ribs have been designed into the cover for maximum load bearing capability. The cover is injection molded in nylon reinforced polypropylene to further enhance rigidity and impact resistance. A nonskid surface is standard. Unlike traditional grease interceptors, the Endura Grease Interceptor is injection molded in engineered thermoplastics providing a completely integrated surface that will not corrode, chip or peel. The cover is secured by quick disconnect latching system. The lid contains a replaceable, o-ring sealing gasket to provide a positive, airtight seal. This o-ring is installed in a channel within the lid virtually eliminating the possibility of pinching and tearing. With a continuous use operating temperature of 220F (104C) maximum, the Endura Grease Interceptor is able to withstand even the most severe operating conditions. All Canplas Endura Grease Interceptors are tested and certified to standard PDIG101 of the Plumbing and Drainage Institute. Made of Engineered Thermoplastic, the Endura will not rust, peel or warp. Capable of supporting 440 lbs. across the lid , the Endura can be installed on the floor, semi-recessed or completely in the floor due to its unique reinforcing ribs. The O-ring sealing gasket is installed in a channel within the lid providing a positive, airtight seal reducing the chance of liquid solids, or odor escaping. Also has a 10 year manufacturer warranty. Has a flow rate of 20 gallons per minute, holds 40 lbs. of grease. "Need smaller sizes. Threaded inlet and outlet on 2inch sizes. More info on deminsions"
I would like to purchase this again.